Cinnamon Sugar Root Beer Bread is a subtly sweet quick bread made with your favorite root and topped with delicious cinnamon sugar. This month’s GYCO secret ingredient was a doozy for me. Not only do we not drink, but on top of that I’m 7.5 months pregnant so buying beer was not something I was even willing to do. Let me just say… I do like a good beer bread myself, but I don’t need the cashier or people standing in line behind me judging me for buying a can/bottle of beer while pregnant and toting my 22 month old. So what to do? 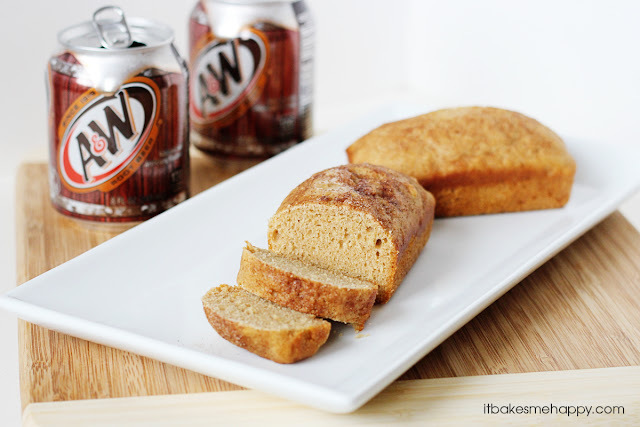 What to make, why bread of course and why not try root beer as my alternative? I read quite a few “beer bread” recipes online just as a refresher, so I would have something to go off of and I decided to adapt this Honey Beer Bread recipe by Ali of Gimme Some Oven. While in the adaptation process I thought I’d go all out and top it off with some cinnamon sugar to play up the sweet root beer notes. I love the sweet, subtle flavor of the resulting bread and because I used my mini loaf pan it baked up in less than 30 minutes. This Cinnamon Sugar Root Beer Bread makes a great snack or breakfast; I’m excited to make French Toast with my leftover bread – enjoy and happy baking! Preheat your oven to 350º and prepare a large loaf pan with cooking spray. In a large mixing bowl combine the flours, sugar, baking powder and salt. Next add the root beer and honey, mixing with a wooden spoon until just moistened, over mixing will result in a tougher, denser loaf. Add 1 Tbs of the butter to the bottom of the pan, pour in the dough and top with the other 1 Tbs of butter. Sprinkle on the cinnamon sugar and bake for 50-55 minutes until a tester comes out clean and the bread is golden brown. Remove carefully from the oven, cool in the pan 5-10 minutes, remove and cool completely on a wire rack. *If making mini loafs, divide the butter up among the wells of the pan and bake for 23-25 minutes. The bread looks super duper delicious! cinnamon and root beer = 2 of my husband’s favourite things. This would be a winner in our house. I love that you used root beer! Although the thought of a pregnant woman buying beer did make me giggle! Thanks so much for sharing! Great that you stepped out of the box and used root beer. This recipe sounds delicious and easy. I will definitely be making this. Oh my goodness- this looks so good!! What a great idea- just pinned it- thanks for sharing!! Oh Emily this sounds super! And Love that you still cooked it up with us… root beer and all girl! I Jen, just found you and love the Root Beer Bread (don’t let those nosy nellies bother you, they need to be home baking LOL). Just signed up for emails. Love your blog!